SENSYN ROBOTICS, Inc. (head office: Shibuya-ku, Tokyo; President & CEO: Taishin Demura), the company known for providing commercial robotics solutions for businesses and local governments, will start offering a beta version of its new TOWER CHECK, a package for tower inspections incorporating the use of drones. The package contains a camera-equipped drone that is operated automatically to take photos of the steel tower to be inspected that produces photography data, based on which areas of rust and corrosion are detected automatically, leveraging AI for image recognition and analysis and to compile reports on the inspection data. This will be the first service offered in Japan to automate everything from drones flown on auto pilot to image recognition and analysis and the compilation of reports in a comprehensive one-stop manner to reduce manpower and costs and to boost efficiency in inspection work. Tower inspections have conventionally been performed based on visual inspections conducted by workers climbing up the structures, which had been weighed heavily by the corresponding work hours and manpower costs, as well as the constant risks of accidents of people falling. TOWER CHECK makes it possible to replace the human work by operating drones on auto pilot for primary and close visual inspections of towers. In addition to its automated operations, it automates everything from simple flight patterns to the compilation of reports as it aims to resolve challenges in all aspects—costs, work efficiency, and safety. According to Sensyn Robotics’ calculations, it is possible to expect up to an approximately 57 percent reduction in costs compared to conventional tower inspection methods. Sensyn Robotics is considering promoting validation experiments and trial introductions of its beta version in order to initiate full-fledged deployments for telecommunications businesses and those who are engaged in the electric power industry. Automated 3-D flight routes will be created using a simple two-step configuration by leveraging GCS with parameters that are specifically for tower inspection work. While flight route configuration work had conventionally been complicated, requiring manual entries for more than 10 parameters, Sensyn Robotics has made it possible to take photos on an automated drone in a two-step entry (to determine the central point and to enter information on the tower) in a wizard format. As the drone flies automatically according to the established route while the camera loaded on the drone takes photos of all parts of the tower to be inspected (patent pending), the system realizes inspections with a high rate of duplicability that is not affected by the skills of the operator. By analyzing and processing images taken by the drone, the system automatically detects sites where rust and corrosion have occurred. A unique engine that applies AI and deep learning is used to capture characteristics of rust and corrosion and to extract sites where such matters have occurred. As to abnormalities like loose bolts, the same level of inspections as visual inspections are enabled by checking images associated with 3-D modeling, which makes it possible for the user to conduct detections as well. Results on rust and corrosion which have been detected automatically are managed on cloud and are automatically plotted (patent pending) on a 3D model as sites where abnormalities have occurred, and a report is generated. Combining visual inspection results by users will make it possible to produce extremely detailed and effective reports. 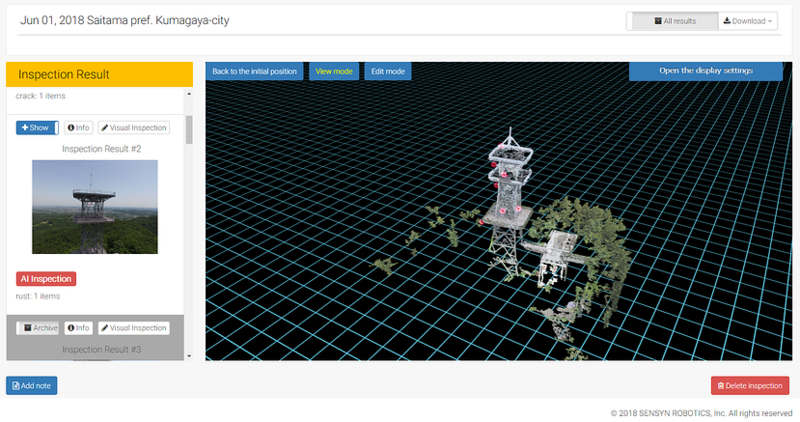 TOWER CHECK uses a unique image analysis engine that incorporates an application of AI and deep learning that has been developed by Research Institute of Systems Planning, Inc./ISP (head office: Shibuya-ku, Tokyo, Representative Director: Hitoshi Kadowaki) to offer a highly accurate feature for detecting rust and corrosion. ISP’s unique technology enables deep learning methods using small volumes of study data, rather than large amounts which are usually required. Procedures may commence without waiting for data to be accumulated to improve the performance of abnormality detection in short cycles to match the accumulation of inspection data. As an initial preparation, training will be conducted on automatic flight plans for towers, using “FLIGHT CORE”*1. Sensyn Robotics staff will offer support at the time of initial inspection, while the second time onward are to be conducted by the user. *The application alone may also be supplied to companies that have their own drones. *1. “FLIGHT CORE”, an automated platform for duties performed by drones. A comprehensive platform that enables automation for the businesses of customers. Comprises three systems: A ground control system, a work performance control system, and a data linkage system, making it possible to automate work procedures using a drone without the need for specialized knowledge or skills. Since its establishment in November 1977, Research Institute of Systems Planning has focused on science and technology-based software development, conducting business in the development of systems for medical information, control and space, telecommunications and networks, image processing, as well as the development of systems, system integration, consultation, technical development, and product development in recent years in the areas of AI.